What’s your style? Farmhouse, Bohemian, Modern, Traditional? 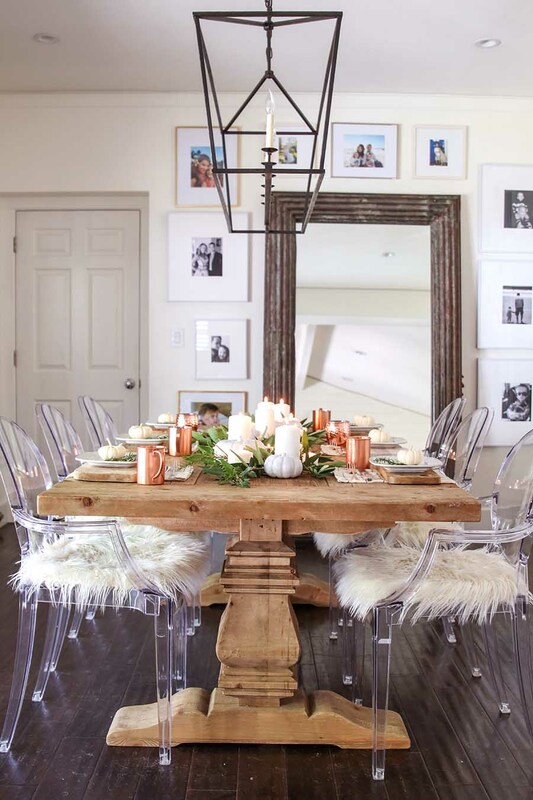 I lean towards eclectic, but in the fall my style takes a turn to a more rustic, farmhouse feel. But it always has a touch of modern. And my dining room is the perfect example of this. 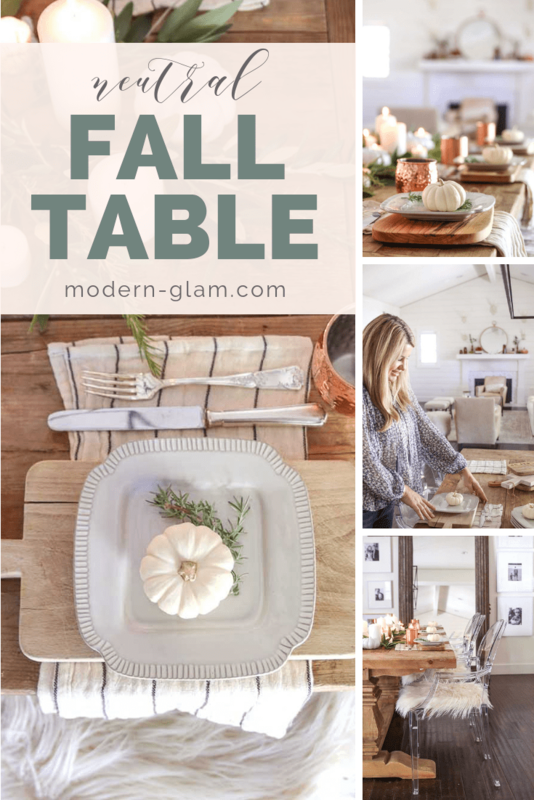 I can’t wait to show you how I created this Modern Farmhouse Fall Dining Room for the season! 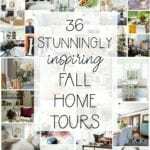 I am joining a lovely group of over 35 bloggers who are also sharing their fall homes, so please be sure and visit them for tons of inspiration! They are listed at the bottom of this page. 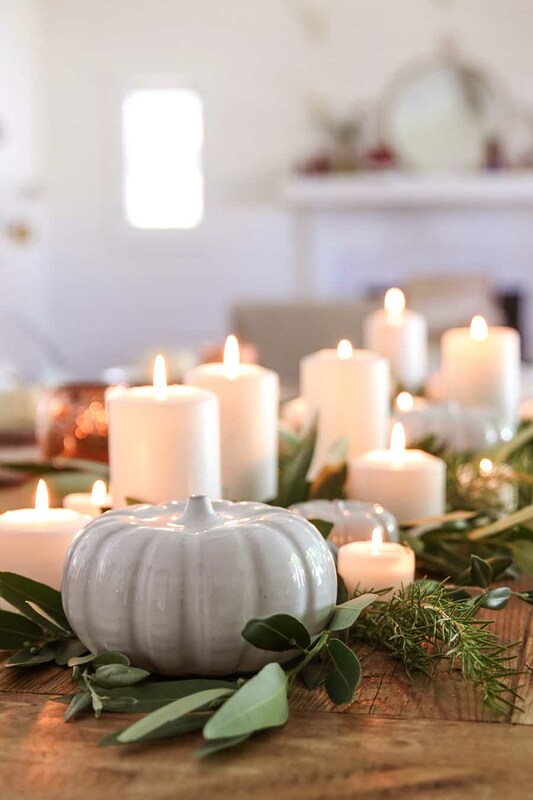 I love to create a tablescape for each season. 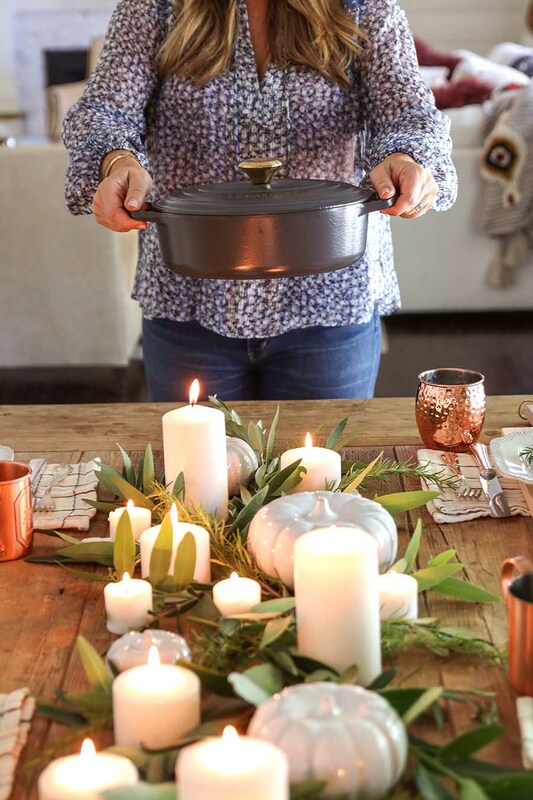 And my Fall Table from last year was just featured in HGTV magazine’s October issue! I was beyond thrilled when they contacted me and asked if they could include it in their fall issue! A serious pinch-me moment! So, in order to top my table from last year I knew I had to get creative! I wanted to set up something that was casual and eclectic. 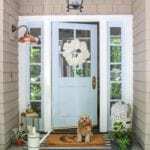 Something that evokes the feeling in your guests that they will want to stay awhile and visit! 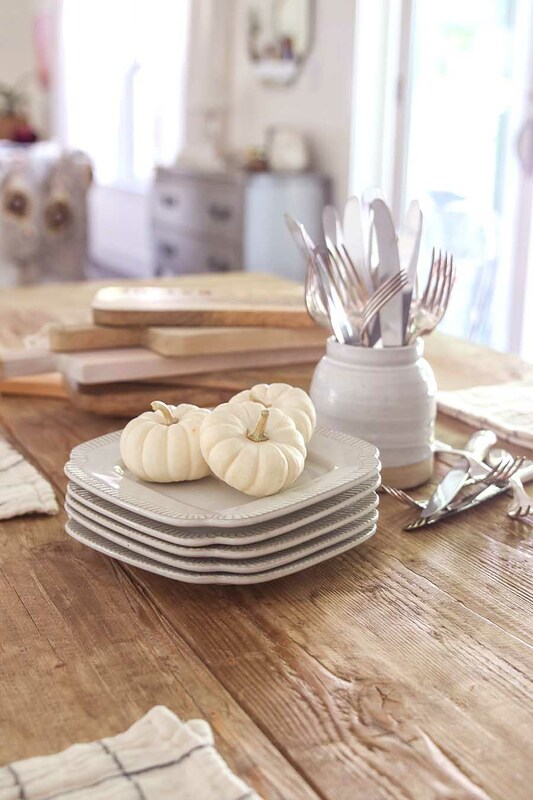 To create this neutral fall table, I started by using what I already had on hand. After all, that’s the best place to start! First, I gathered together my breadboards. It’s quite the eclectic mix! Some are vintage and some are new. 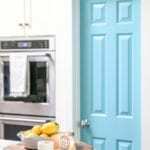 They vary in the finishes too. This creates more interest, don’t you think? See, nothing is cookie cutter at my house. Even the flatware is a mix of vintage French hotel silverware. And no two are alike! 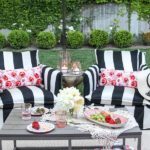 I love to create place settings that are different from each other, but they also need to have unifying characteristics that keep your whole look cohesive. And by using the same plates at each setting, everything flows together! I knew I wanted the colors to be neutral mixed with the warmth from the woods. So, when I found these plates from Target, everything started to fall together! Do you ever have that aha moment when you find just the item you were looking for? I love it when that happens! These plates were the only things I purchased new to create this table. 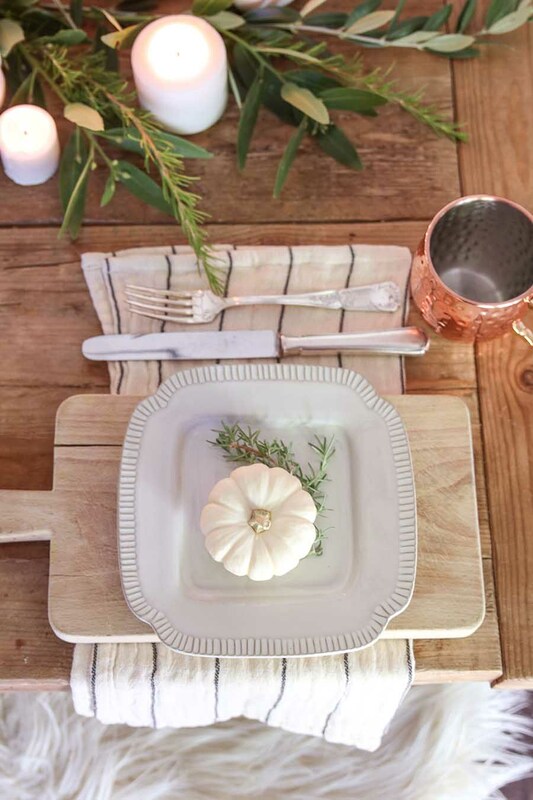 I added some casual yet neutral plaid napkins and a white pumpkin to each place setting. Keeping it simple this year is what I’m going for. 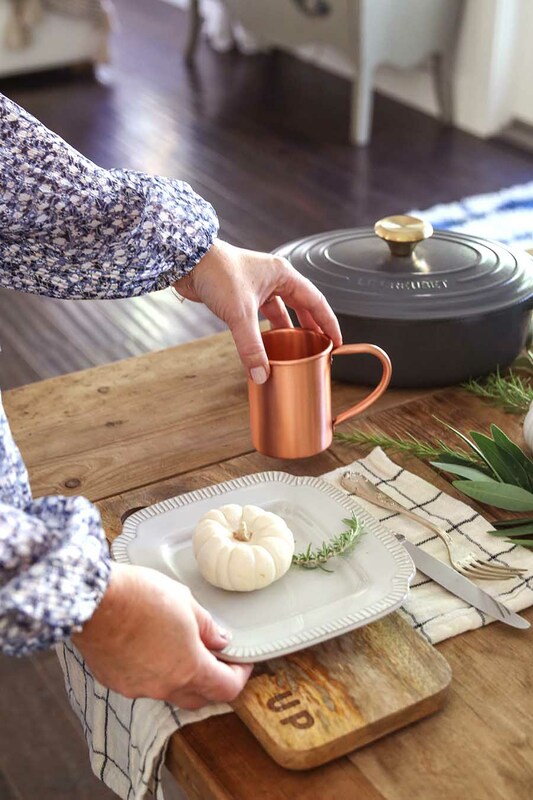 I used our copper mugs for a perfect pop of color. And again, they are all different, collected over the years. As the weather has been cooling down, our family has been enjoying taking walks in the evenings. And on our walks I have spotted so many great herbs and plants. I have wanted to make an herb table garland for some time now and I knew that it would fit in perfectly with my Modern Farmhouse Fall Dining Room! A mix of bay leaves, olive branches and rosemary stems were all I needed to create this centerpiece. 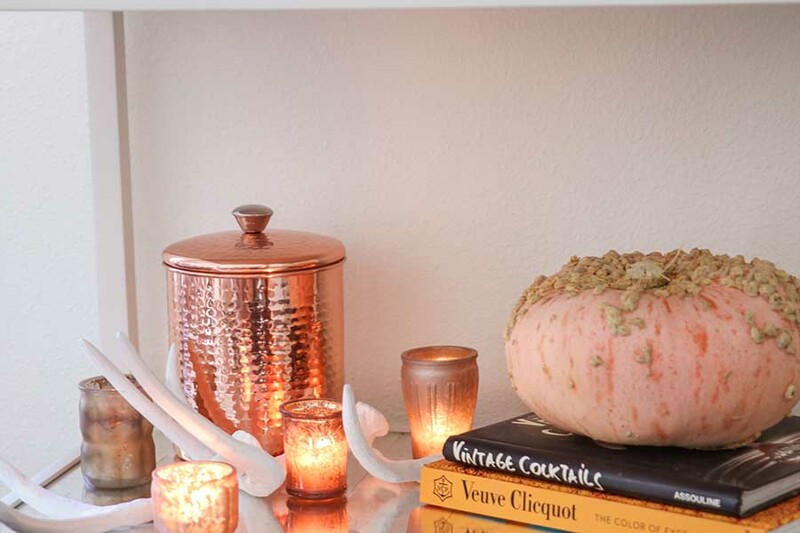 Add in a few neutral white pumpkins, some candles and it’s the easiest centerpiece to create! 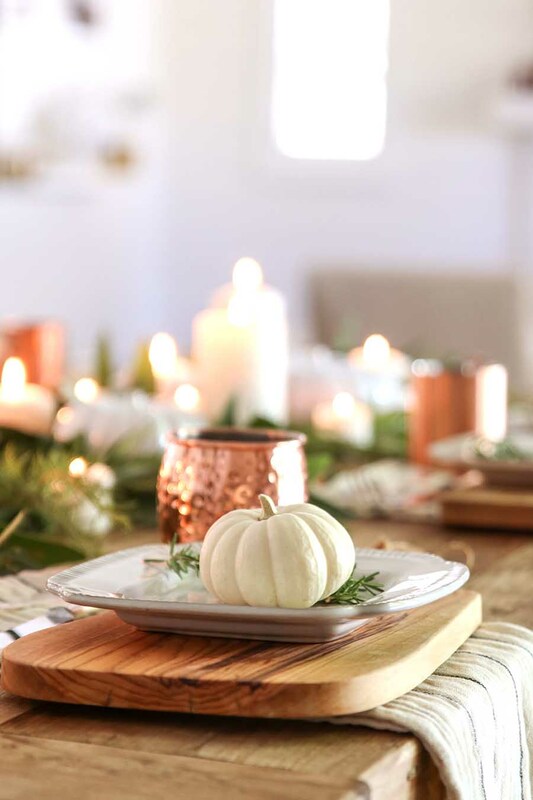 Check out the full DIY in my post Fall Table Garland DIY using fresh herbs. 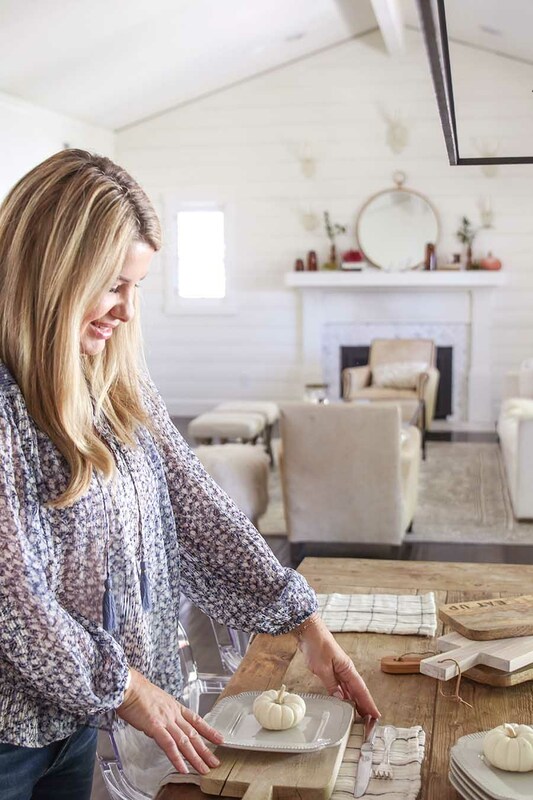 If you’ve been following along, you know how much I love to update our bar cart for each season. Last year I utilized it for my Fall Coffee Station. Because our bar cart sits next to our dining room table, it is the perfect area to prepare a pre-dinner cocktail. 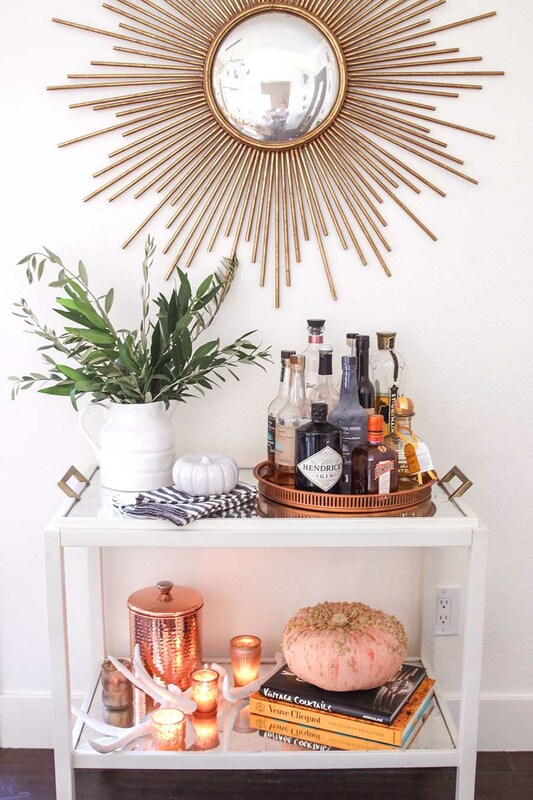 I updated the bar cart with all the essentials to mix a yummy drink and added some touches of fall to the bottom. I love how the copper continues over to this area. 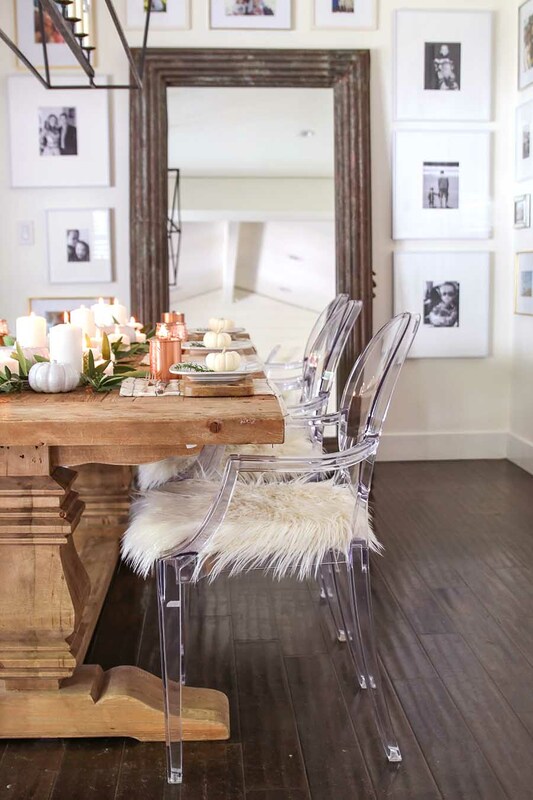 Thank you for stopping by to see my Modern Farmhouse Fall Dining Room. Next on the tour is Tristen’s fall home over at The Grace Gathered Home. 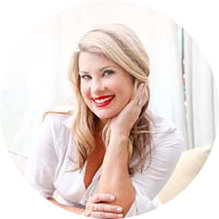 Please stop by and visit all the other lovely bloggers joining me today! I always get so inspired from these tours! 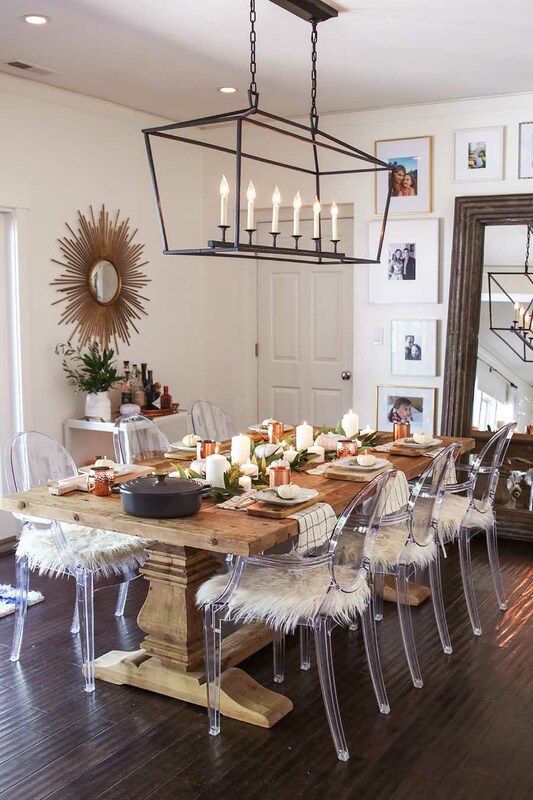 Ashley I am in love your your tablescape! I also really need that table in my life. It is perfect for Fall! Im so glad I could join this hop. Happy Fall! 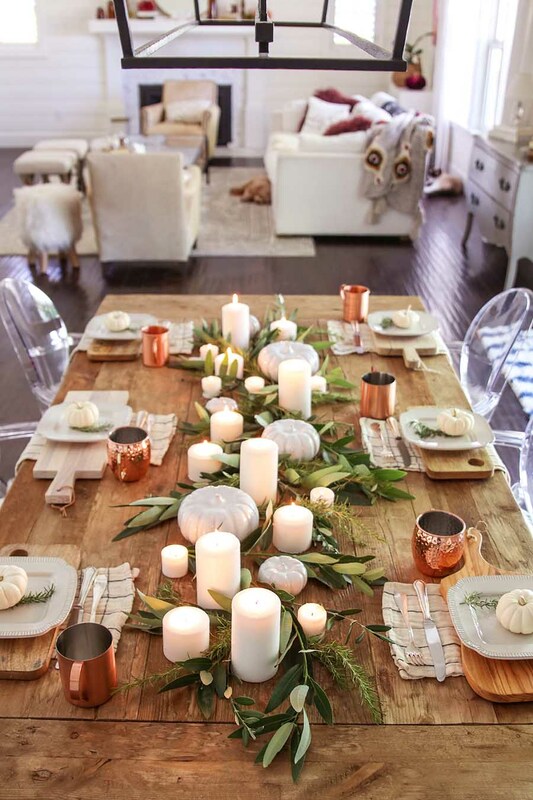 I love your fall tablescape, Ashley! So pretty! Oh my gosh! I love your style! I’ve never been to your blog before! it’s so pretty! Thank you Shannon! what a complement! 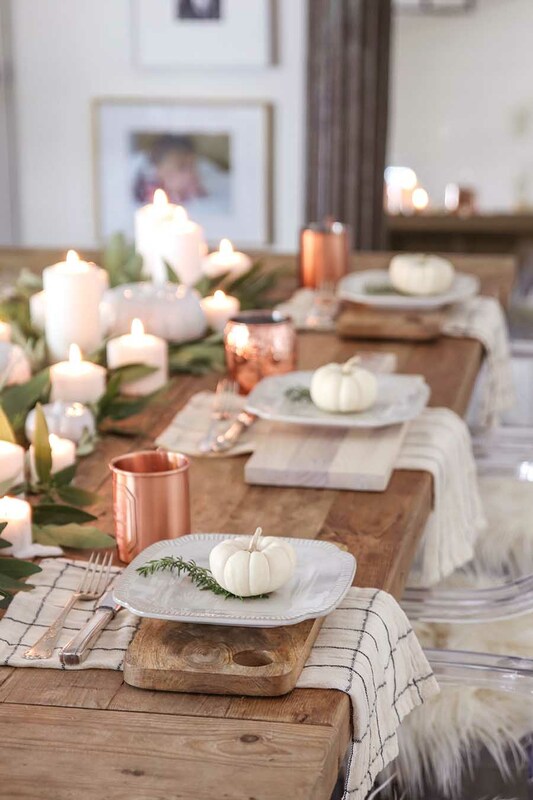 Love your fall table, Ashley! 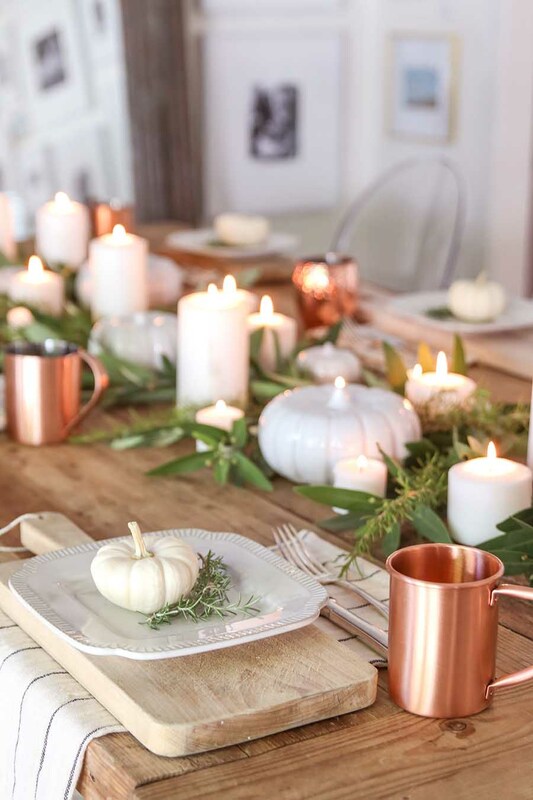 The candlelight is so gorgeous, and the pops of copper are perfection! So fun to be “on tour” with you today! 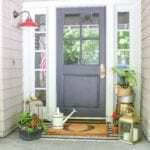 I have just discovered your blog and am in awe of how pretty everything is! I love your dishes and wondered what the name of them is? I looked on the Target sit, but could not find them. Thanks! Thank you so much Colleen! I’m glad you found me! It’s all so gorgeous! 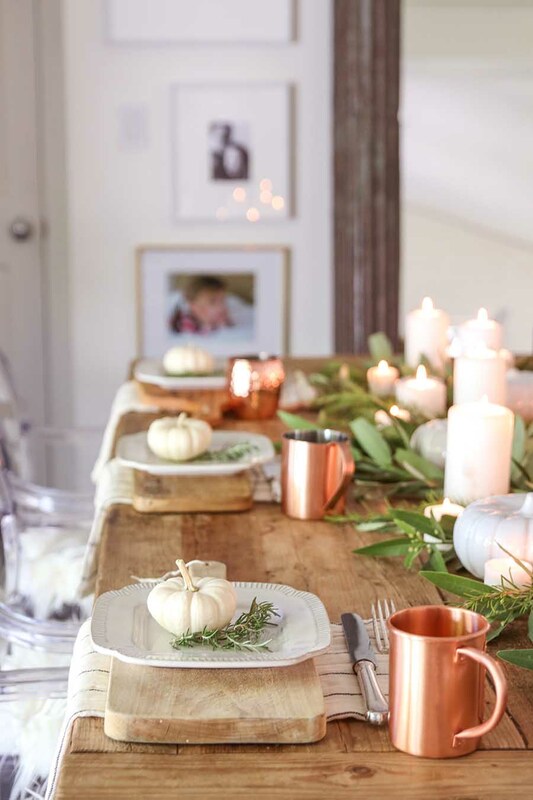 Love the layers, candlelight and mix of copper on your tablescape.